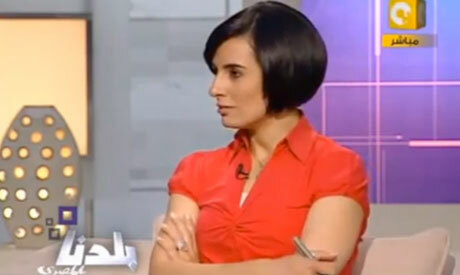 Sarwat Hammad, an investigative judge at the Ministry of Justice, ordered the release on Monday of media anchor Reem Maged on bail, after questioning her on the charge of insulting the judiciary and commenting on judicial verdicts. Maged was accused of speaking inappropriately about judges in the introduction to her popular evening 'Baladna in Misri' (Our Country in Colloquial) programme on ONTV satellite channel, and of allowing her guests to do the same thing. Maged, along with a number of television presenters and the chairman of ONTV, are facing investigation on the same charges. Minister of Justice Ahmed Mekky had assigned Hammad to investigate the charges over a month ago, after around 900 judges had filed reports against television channels on the charge of insulting the judiciary and commenting on judicial verdicts. A week ago, prominent television presenter Hala Sarhan was released following the same charge of speaking inappropriately about judges, including Judge Ahmed Refaat, regarding cases related to the killing of protesters. Riham El-Sahly, host of a talk show '90 Minutes' on Mehwar TV channel was also questioned along with her producer Beshir Hassan. All have now been released pending further investigation. In 2011, Reem Maged along with prominent revolutionary blogger Hossam El-Hamalawy were questenioned by the former military council for stories deemed disrespectful to the military. It is done between two diffirent and opposed concepts or acts. It may go against a popular one or for it. We must accept it as it is. Making comment is silly. If you donot like it, take for appeal. An independent judiciary is accountable to the public for its pronouncements and conduct.The decisions should be made in public and subject to public scrutiny. The role of independent media is to hold public officals to account and the judiciary are of the body of public officials. That should not be controversial. This is frivolous action by the judges and they should be ashamed. In fact it is proof that they cannot be the custodians of the aspirations of the revolution. The judiciary should be transformed. I completely agree. Such a judiciary shows quite clearly that it has been infested by malaise and must be dealt with accordingly. I find it difficult however being stuck being a judiciary that is corrupt and a President that is making attempts to cleanse the judicial system but nevertheless at the behest of another similarly corrupt system of MB appointees whom offer no viable alternative. Sometimes one begins to feel hopeless about the whole situation. I pray to God the blood of the martyrs was not spilt in vain.